Back in 2009, I did a three part series on perspective (go to left-hand column to see archive link). I just finished teaching a six-week course on the subject and because it’s so fresh in my mind, I thought I’d share some of the lessons with you. BTW, I’ll be teaching a Perspective Workshop at PCC in the winter term at Sylvania. So let’s first begin with some terminology. Some of you may remember this stuff from your old geometry classes. Horizon line: Back in kindergarten or first grade, we were all taught that the horizon was where the sky meets the land. And while, that is a correct answer, it’s not so in art. Defined, the horizon line is at the eye level of the viewer, artist or photographer. If you are standing up, your eye-level will be higher than when you are sitting down. In other words, the horizon line changes when your eye-level changes. For example, let’s look at the following picture (A). Where is the photographer standing with his camera held next to his eye? Is he looking at the scene from above the lighthouse? Below the lighthouse? Up near the window walk in the tower or closer to the house? Maybe right in the middle of the tower? This is the hardest part for most of us to comprehend. It's really all about the photographer and his viewpoint. To understand this, let's look at a couple of more terms. Parallel lines. 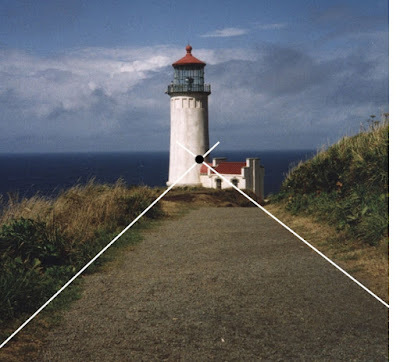 To create the perspective of anything, you must have at least two parallel lines. 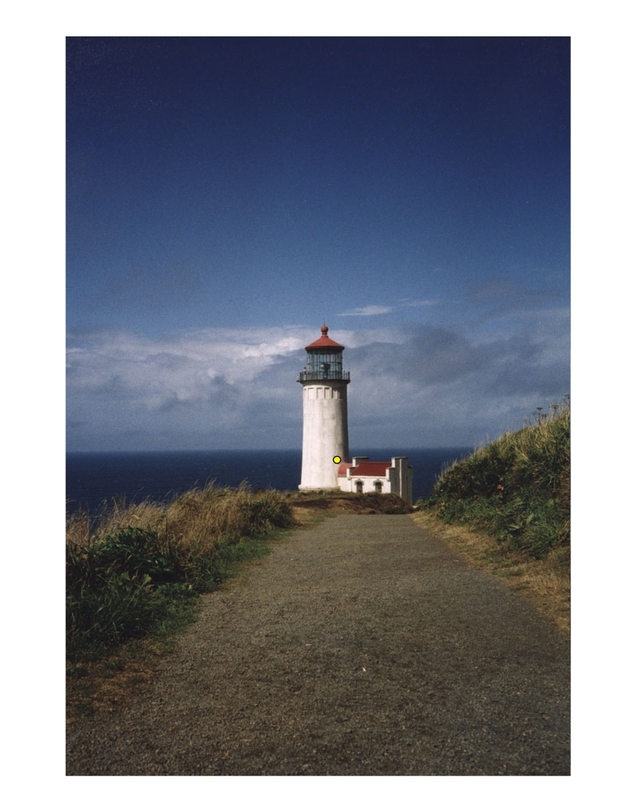 Notice that the photograph below has two lines headed for the light house. Convergent lines (vanishing lines or orthogonal lines). These parallel lines are called convergent lines because they will eventually converge onto one point. See photo B below. Vanishing point (VP). The point where the lines converge is called a vanishing point or VP. There's an old saying , "All lines meet at the vanishing point," which helps me to remember the concept. See photo C below. So why is it so important to find the vanishing point or VP? Because once you've found the VP, you have actually found the horizon line (HL) because vanishing points live on the horizon line* (which BTW appears in photo D below). It's really that simple. Well, I hope it seems simple. What we've just explored is called one-point perspective. Before the Renaissance, artists didn't really understand perspective--that is, European artists. Most of their work was flat and had little depth. The only exception was the use of color. To indicate some distance, the artists would paint that blue haze in the distance. Without using perspective, things do look rather one dimensional. For instance, what do exactly see below? Here is a triangle touching a straight line. But what happens if a dotted line is drawing right in the middle of that triangle. What do you see now? The "perspective" is totally different, isn't it? A road going into the horizon. I bet you can even label these lines based upon what you just learned. Next month, we'll explore one-point perspective further. It's really neat when you learn how to do this stuff from drawing arches to the interior of rooms. Stay tuned. * I'm talking here about one- and two-point perspective.